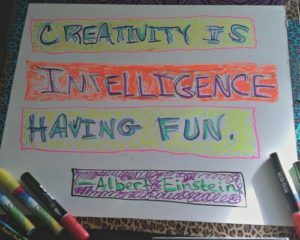 Do you feel like you have to disengage from simple pastimes like coloring because you’re, well… all grown up and so your tools have to “grow up” as well? Well I am here to tell you your tools don’t define you – even if you hold a master’s degree in fine art this unique artist marker set will make you feel like a free spirit again! 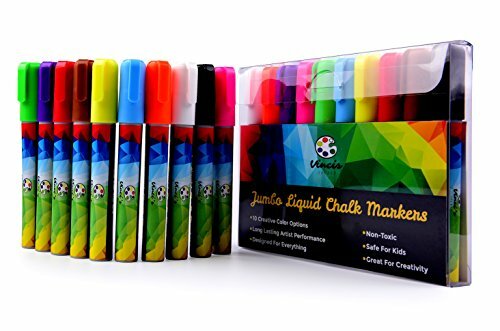 This Liquid Chalk Marker Set Works on Any Nonporous Surface! 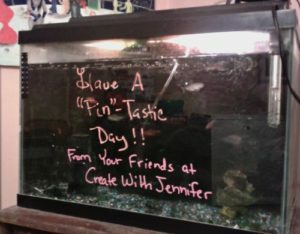 How to use these versatile dry erase paint markers? Where to Buy These Chalk Markers? If you’ve ever been to a public venue that displayed colorful holiday-themed designs on the windows, chances are you probably wondered what they were made from – at one time it may have been tempera paint which is water soluble. Maybe you wanted to attempt something like this on your own, but you certainly wanted something removable first! The good news is, this unique artist marker set is made with ink that not only is removable but adheres to all nonporous surfaces like windows. As you can see, I was delighted to be able to use them on my dry erase boards as so many markers intended seem to dry up sooner than expected. It’s not everyday that I see erasable chalk markers that’ll glide on a slick surface without a hiccup. Great for everyday mundane things like memos, “honey do” lists and don’t-forget deadlines. But why stop there, you can also leave cute notes around on the fridge or bathroom mirror. Upon removing from the package, each barrel indicates the ink color. You want to shake them up vigorously so the ball gets rolling literally (these are just those kinds of markers with the metal ball in them). When the pens are in their brand-new state the felt tip is clean white. After you have broken them in you will only need to re-shake them sparingly a few times. You may need to press down a little on the tip to get the paint flowing better. After the occasion or holiday is over in which case you’ll have to, sadly, clean off your design (that’s when your smartphone camera will be your best friend!) You can use pure water from an atomizer bottle and a soft cloth, now if you run into what I did with the darker colors (black, purple, and red) they kind of have more staying power, which must be common in dark pigments. You may need to apply Windex or one of my favorite cleaning agents, Pledge multi-surface spray . Don’t freak out, it will come up! I know I may have said “all nonporous surfaces” earlier, but if you have any doubt with something you do not want stained under any circumstances – you may want to stick with the lighter colors or abstain from that surface altogether. Well, my set came from Amazon, and this company does have a website…I think they are a young company in their early stages. I had a pleasant dealing; the pdf bonus came a few days via email after I received the artist marker set in the mail…that part hadn’t crossed my mind then so it was a pleasant surprise. Halloween is approaching which means that Thanksgiving and Christmas are not too far behind. Forget the sticky vinyl window clings this year and draw your very own designs on the windows or storm doors! If you have kids, get them involved too, as these erasable chalk markers are not only fun but are nontoxic and certified safe for ages 3+. I also received a bonus gift nicety from the company owner, Matt. I got 2 pdf’s: one is a coloring mini-book with 10 black and white illustrations in varying levels of detail (of which I don’t think I would use these markers as the ink may be a tad too strong for the paper.) The second bonus is an 8-page bonus guide on honing your art techniques.